The Nephilim, a legendary existence, present in tales and stories of old, long lost by the passage of time, the descendant from the celestial beigns, with bodies stronger than those of normal people, and brilliant minds enlightened and resilient, drove the forces of evil back to the depths of hell, heroes of the world, the benefactors of freedom in the old age. Now nothing more than stories of the past, whispers and myths, so old a story, that are either forgotten or no one believe them to be true, gone from the world for over four thousand years, no records of them can be found anywhere but in stories passed down mouth to mouth, and these have been distorted by the pass of the ages and are used as child stories. Hellbent on revenge, an angry young woman cruises the world looking for answers, walking the road of carnage with never ending rage, she travels through countries in search of her unknown enemies never forgetting what happened in the past; Her city razed to the ground and burned to ashes, friends and neighbors hung, impaled or mutilated, her family slaughtered in front of her while she was forced to be hidden. Will she ever find what she seeks? what will her path turn her into? The Gatriel Decebal Chronicles has not been tagged yet. 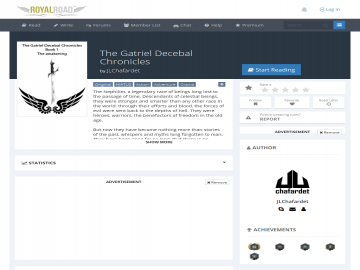 Help others find The Gatriel Decebal Chronicles by tagging it! The Gatriel Decebal Chronicles has not been reviewed yet. The Gatriel Decebal Chronicles has not been recommended yet.